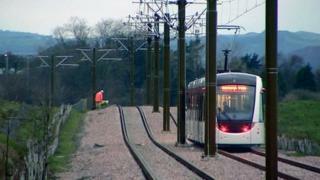 Edinburgh Trams lost almost £450,000 in 2014 - less than expected due to higher than predicted passenger numbers. Three million people used the trams, following the launch of the service at the end of May 2014. Bosses estimate it will take three years for the trams to make a profit. Meanwhile, Lothian Buses said it carried 118 million passengers in 2014. The record figure allowed it to pay a dividend of £5.5m to its public sector owners. Lothian Buses generated revenue of £135.3m last compared with £132.3m in 2013. It resulted in profit after tax of £8.24m (£8.58m in 2013). Edinburgh City Council is the bus firm's major shareholder. The trams began operating on 31 May last year after six years of disruption and cost increases. Lesley Hinds, chairwoman of Transport for Edinburgh, said: "Everyone across the Transport for Edinburgh Group is to be congratulated for delivering a hugely successful operation over 2014. "Innovations and improvements have been introduced such as new websites, customer mobile apps and refurbished Travelshops - all enhancements to the experience of passengers. "Lothian Buses, and now Edinburgh Trams too, sit at the heart of life in Edinburgh, moving people to where they need to be in their millions each week, and driving our economy. "These services are essential to the success of the city and I'm pleased that we're moving forward positively."